August 4, 1903: President Foreman of the South Park Board receives a letter from Marshall Field in which the merchant and real estate baron shares his desire to move forward with his offer to pay for the Field Columbian Museum as soon as the lakefront ground is ready for the site. In the letter Field writes, “I am ready to go forward with the building whenever materials and labor are at reasonable figures, which probably will be as soon as the ground is ready for building. Regarding the exact location, I think that can be safely left to your board.” [Chicago Daily Tribune, August 5, 1903] The site the park board ultimately chooses for the museum is exactly the location of today’s Buckingham Fountain, east of the railroad tracks and at the foot of Congress Street, extending north and south from Van Buren to Harrison. 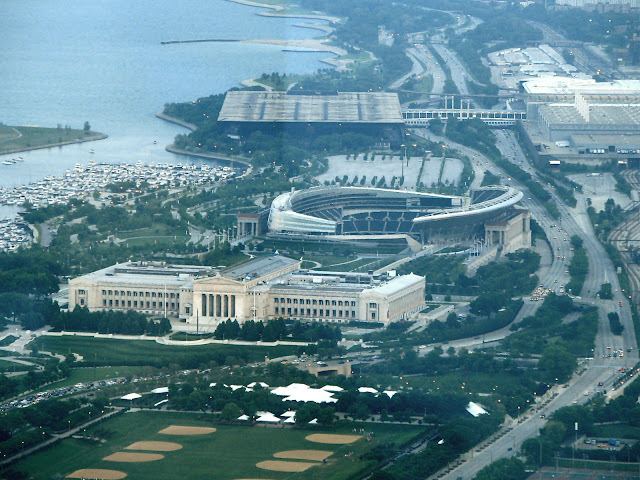 Foreman responds to the offer, saying, “The Field museum will be the central gem in the greater Grant Park. It will stand on a slight elevation, will be visible from all directions, and will present an especially imposing view. The building, I am sure, will be the finest of its kind in the world. Mr. Field is not in the habit of doing things half way or half-heartedly.” Field would die in 1906, and it would be another 15 years after his death before his namesake museum would be opened after a decade of acrimony and lawsuits contesting the choice of the original site in Grant Park.